Are Those Spidery Black Things On Mars Dangerous? (Maybe) : Krulwich Wonders... From Earth, lifeless Mars can seem like a serene and boring planet. However, scientists noticed some little black dots in a satellite image of the Martian sand that may hint at an exciting, explosive geography. You are 200 miles directly above the Martian surface — looking down. This image was taken by the Mars Reconnaissance Orbiter on Jan. 27, 2010. (The color was added later.) What do we see? Well, sand, mostly. As you scroll down, there's a ridge crossing through the image, then a plain, then dunes, but keep looking. You will notice, when you get to the dunes, there are little black flecks dotting the ridges, mostly on the sunny side, like sunbathing spiders sitting in rows. Can you see them? What are those things? They were first seen in 1998; they don't look like anything we have here on Earth. To this day, no one is sure what they are, but we now know this: They come, then they go. Every Martian spring, they appear out of nowhere, showing up — 70 percent of the time — where they were the year before. They pop up suddenly, sometimes overnight. When winter comes, they vanish. As the sun gets hotter, they get more spidery. Here's a closer image — like the one above, this gorgeous print was created by the photographer Michael Benson, just published in his new book, Planetfall. It shows two mounds of sand. The spidery thingies, you'll notice, stay on the rises, not on the flat sandy plains. "If you were there," says Phil Christensen of Arizona State University, "you'd be standing on a slab of carbon dioxide ice. All around you, roaring jets of carbon dioxide gas are throwing sand and dust a couple hundred feet into the air." The ground below would be rumbling. You'd feel it in your space boots. That, anyway, is the leading explanation. The spidery traces that you see in Michael's two prints might be clumps of dark, basaltic sand thrown from the geysers. Or — say a group of Hungarian scientists — they might be colonies of photosynthetic Martian microorganisms, warmed from the sun, now sunbathing in plain view. We still don't know for sure.We've been watching those spider patches come and go for the last decade or so, and for a little while longer, we will have to guess why they're there, or what they're telling us. We'll have to keep looking. 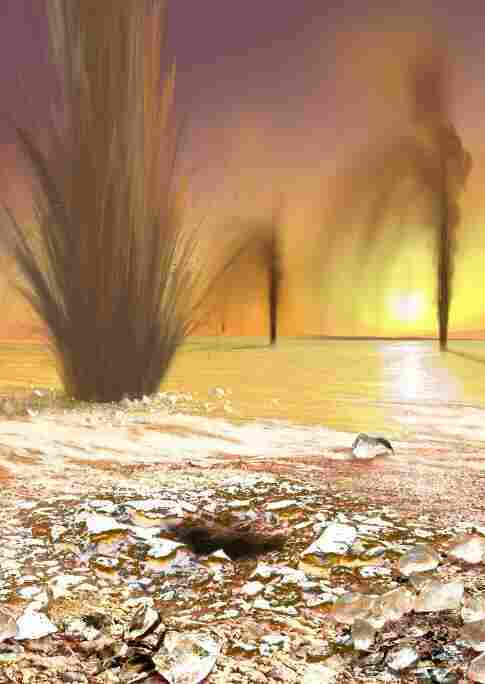 A 2006 letter in Nature described this idea of geysers near the Martian south pole. Some American scientists then proposed a "Mars Geyser Hopper," an instrument built to investigate geysers that could "hop" from site to site. (Avoiding, one presumes, sudden gushers from below). Michael Benson's new collection of prints, taken from the digital printouts transmitted by exploration space telescopes, are works of science and imagination. The images are black and white in origin; the color is added. Michael calls his technique "true" color, meaning, he's choosing a spectrum that represents what a human eye would see if a human eye (and brain) were on the scene. His newest is called "Planetfall: New Solar System Visions."